We all appreciate the seasonal Steam sales and all give our thanks to Gabe Newell in some way – mostly by emptying our wallets in tribute – but Valve has taken it to another level and has gone all out with a giant screen featuring the Gaben Steam sale meme YouTube video in its office. The floor-to-ceiling display featuring Newell’s face was spotted at the end of a Valve office tour and a photo was posted on Reddit. Whether these displays go through a reel of different images or just Newell’s face on loop isn’t clear from the photo. In the same Reddit thread, a Valve employee has confirmed that the studio has not one, but two of these displays and that “they are both huge.” While this may seem strange to some, our office also has creepy pictures of our bosses staring down on us as we work. Just one of the many similarities between us and Valve – we also aren’t making Half-Life 3. 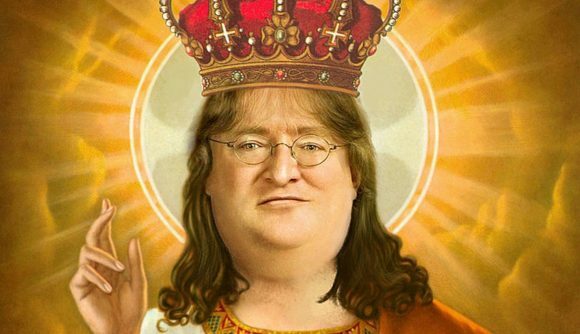 For those who aren’t familiar with our Steam sale messiah, Gabe Newell is the co-founder of Steam and so is responsible for the platform’s seasonal sales with the meme popping up whenever there are Steam sale discounts. A bit of meme history for you, the meme can be traced back to Uncle Grim’s video TONIGHT’S THE NIGHT and further back to DeviantArt user freddre’s image. If you want to see the Gaben wall shrine then Valve offer office tours which can be organised through their website.